March is £10 snip & chip month! Just Sunday 31/03/19 to ring and sign your cat up to Gosport Cats Protection's snip and chip campaign in the PO12 & PO13 postcode areas during March. This is a great opportunity to get your cat neutered and microchipped at the bargain price of £10! Kittens can be neutered from 4 months of age and older cats can also be done so this is a great time to help your cat be healthier and safer. 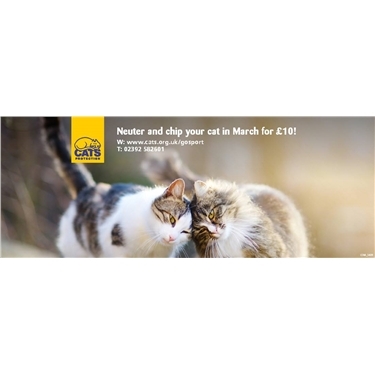 The £10 offer is on until 31/03/19 so owners on a low or limited income, students, pensioners or if you’d struggle to pay for neutering and microchipping, should ring Chris on 02392 582601 to make sure you don’t miss out. Gosport CP wants to help as many cats and owners as possible so do phone for more details and to register your cat(s) for the £10 offer. We can loan cat baskets and may be able to help with transport to and from the vets as well.